Brain-Computer-Interface-Dynamic-Darkforest (BCI-DDF) Go system is firstly and jointly developed by the research collaborative team from National Chiao Tung University (NCTU), National University of Tainan (NUTN), University of California San Diego (UCSD), and National Center for High-Performance Computing (NCHC). In the special event of IEEE SMC 2017, our team first integrates the Brain Computer Interface (BCI) into the Dynamic Darkforest (DDF) Go system. The novelty of the BCI-DDF Go system is utilizing the world latest wireless EEG system (developed by National Chiao Tung University) to extract the Go player’s brain waves to play and compete with the DDF Go system directly. We adopted steady-state visual evoked potential (SSVEP) to collect the brain signals from the visual cortex (O1 and O2 channels) and performed the real-time signal processing to the cloud sever. Five pilot players has been tested of the BCI-DDF Go system and the average accuracy can be over 90%. 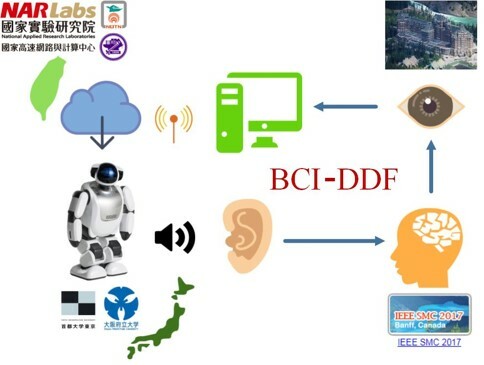 The demonstration of the BCI-DDF Go system has a new implication of the breakthrough in human brain and interaction with the artificial intelligence.